Here is an action packed game from rd5. Both sides are attacking each other in a complicated game but black seems to have more threats. How should black continue? Piroska Istvan took clear first with 5.5/6. I was top foreign player with 4/6. Thanks to Thomas Heyl(GER) for the photos. Here’s my rd 6 game. 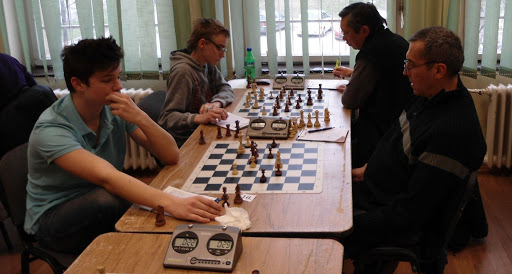 I drew with black against promising junior Varga,R in a long hard game. pressed with the bishop pair in a closed position but could not make anything happen. Varga already had 2.5/3 against FIDE 2000+ players so I was careful not to be the next victim. I tried as hard as I could to break white down but in the end could not. However, there was nothing there to be found as it was easier to get blood out of a stone than to squeeze a win out of this position. I finished with 4/6 in a nothing special result. 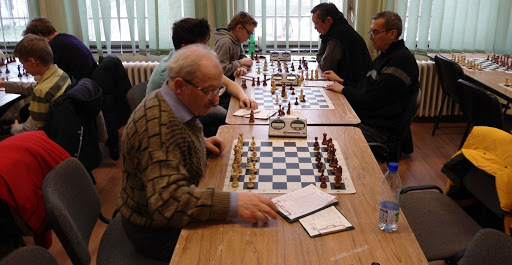 My one forgetable game in rd3 exposed a hole in my repertoire and in the two draws I conceded, one I could have done better and the rd 6 game I have yet to review. There were 13 2000+ players who took part which translates into 8-9 middle age guys trying to walk through a wall of juniors for three days. There were upsets every round and plenty on interesting games. I won with white against young Forgacs,Andras(1448). Mark Medve beat Mester,A to get to 5-0. I lost a nice game to Medve in the Xmas open just a couple of months ago and he had gained about 100 FIDE points since then. I did not see how the Medve game turned out before I left. Here is my rd5 game. The middlegame is going well for white. Black’s king is exposed and white has an extra pawn. White’s queen has just been attacked. What should white do about it? i tried as hard as I could to break down white’s defenses but in the end could not and offered a draw. This was quite disappointing as I had the advantage(or so I thought) for most of the game.Here’s my round 4 game. The has been going well for black. There is some pressure on the kingside and white’s pawn structure is compromised. What do you recommend for black now? I started the day with a sense of optimism. But this ended quickly as my opponent poured cold water on my dreams with a quick victory. Here’s my round 3 game. Black is setting up for 13…Qh4. What do you recommend for white? I got off to a normal 2-0 start which is not so easy in Budapest, at least for me. As I left strong junior, Tibor Bodi, was down a piece for a pawn in what looked like a lost ending. Here’s my round 2 game. After 39.Kg2, the kingside looks secure. What do you recommend for black now? 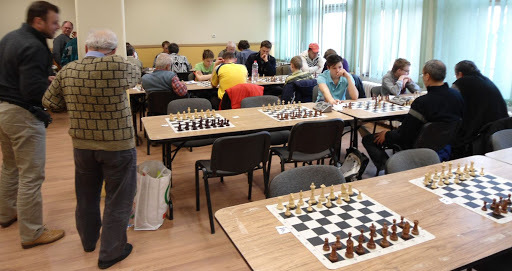 74 players are playing in this typical Budapest weekend open. Entries are limited to FIDE under 2200 players, as this is the maximum rating for 90 minutes per game allowed by FIDE rules. The entry fee was 3,000HUF less 10% for the Budapest Discount Card that I bought. My ego took a beating as I saw my rating sank to FIDE 2009. When all the entries were processed, I started as the modest #13 seed. There were two upsets in round 1(at least 2). White played the early middlegame very aggressively and quickly obtained two monster passed pawns. However, they are in danger of being blockaded and picked off. What do you suggest for white?